PIG UCR Chest Rig Review - The Best Bang for your Buck! Just like the other tactical chest rigs available in the market, the pig chest rig plays a similar role except that it does come with additional features. These chest rigs are usually large, versatile and are reasonably priced. The PIG UCR chest rig is among the best chest rigs available in the market. Based on the original Eagle Universal chest rig that was designed by Paul Howe. This classic combat kit comes with a combination of quality, versatility, toughness and simplicity. 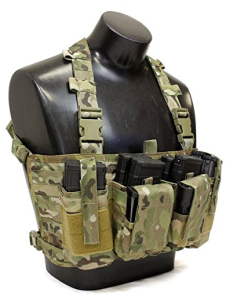 The PIG chest rig has ample space for storage of additional ammo and mags. Each of the 4 large pouches has the capacity to hold 2×M4 mags or a 1×7.62 mag. There are four additional pouches which are capable of holding double stack pistol mags, flashlights and knives. On the side of this combat kit, there are additional MOLLE that can be use to hold more pouches. 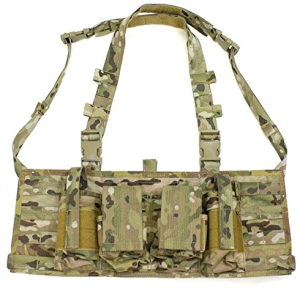 These pouches are ideal for holding radio/phone, additional ammo or a first aid kit. Unlike other combat kits that rely on the hook and loop closures, the PIG chest rig takes advantage of the velcro design to keep your stuff well protected. Designed with ample space – the PIG UCR Universal Chest Rig features 4 large pouches. Each of the 4 pouches has the capacity to hold 2×M4 mags or a 1×7.62 mag. In addition to this 4 smaller utility pouches have been included to hold pistol mags, radio, first aid kits and additional ammo. Compact design – designed similar to the SKD Version, the PIG UCR chest rig features a 500D construction for less weight. Its design is compatible with the CR H-Harness Kit for compatibility. The Velcro closures, the adjustable retention straps and the buckles all ensure that your is gear safe and sound at all times. Available in multiple colors – the best thing about the PIG chest rig is that it’s available in multiple colors of your choice. Among these colors include Coyote Brown, Black, MultiCam and Range Green. The PIG UCR Universal Chest Rig is designed with ample space enough to hold 8 M4 mags, pistol mags and other personal tools. The double stitching puts the entire kit together making it tough and durable. This PIG chest rig comes in a variety of different colors to suit your preference. Weighing just 1.1 pounds, the PIG UCR chest rig is very light as compared to other condor rigs. There are no grommets at the bottom of the pouches. This makes it hard to use the PIG chest rig when it’s raining since the pouches are likely to be filled with water. You can make a small hole if this bothers you. There is a lot to say about this chest rig, especially when it comes to performing its intended purpose. The quality is good, the stitching is perfect and colors suit every customer’s taste. The MOLLE webbing holds 4 large pouches that are capable of accommodating 8 M4 mags, pistol mags and other tools. The straps allow plenty of adjustability to suit both small and heavy bodied users. Having received a 4.4/5 star rating, I would highly recommend all potential buyers to consider purchasing the PIG chest rig as it’s the best bang for your buck. Go back to read more reviews about chest rigs.